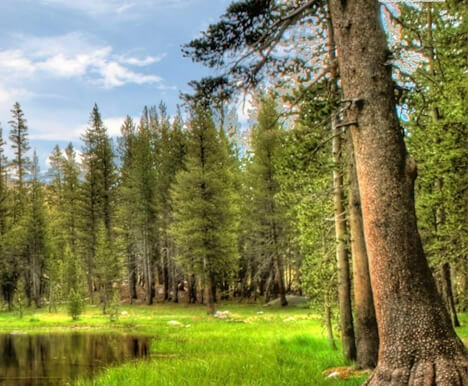 The US EPA Toxic Organic Methods TO1 through TO17 were developed for ambient air analysis over a period from 1980 to the mid-1990s. Methods TO14(A) and TO15 are canister methods initially developed around the utilization of a 6L canister to sample ambient air down to sub-PPB concentration levels for analysis. Over the past 20 years, laboratories have also applied Method TO15 to collection and analysis of soil gas samples. Surprisingly, between 50-80% of all “TO15” samples analyzed by today’s contract laboratories are related to soil gas analysis. While very low level detection limits are required when measuring the impact of soil gas intrusion on Indoor Air Quality, progress over the past 20 years, in the form of both higher sensitivity mass spectrometers and sample preconcentrators with better system hygiene, has further enhanced the “signal to noise” ratio without requiring more signal (larger sample sizes). These advancements are allowing for smaller sample volumes to be used to achieve required detection limits. In particular, since soil gas concentrations are expected to be 10-1000x higher than the indoor air in buildings directly above the contaminated soil, less sample is required when measuring sub-surface soil gas. Soil gas frequently needs to be diluted to bring it into the calibrated range of the method. Prior to the use of canisters for soil gas analysis, most soil gas measurements were made using a 10cc gas tight syringe, with an analysis in a mobile lab, either using a Purge & Trap system, a loop injection inlet, or by a simple splitting of the 10cc injection. Most Purge & Traps do a 20:1 split upon injection from their 1/8” trap, so each of these techniques yields similar detection limits. When canisters became accepted for soil gas measurements, most of the canisters in existence were the 6L variety, so it made sense to start using those. However, compared to the 10cc syringe, the 6000cc volume of the canister was collecting far more sample than was needed for the analysis. It was also determined that such a large volume could more easily draw ambient air down from the surface, diluting the soil gas and creating a negative bias in the analytical results. Therefore, there was a need to reduce the size of the sampling canisters to avoid exceeding the volume of equilibrated downhole soil gas. So how small can we make canisters while still being effective for soil gas monitoring? Some things that limit how small we can shrink canisters include. "Collection rate is what is important..."
For sub-surface soil gas collection, a “collection rate” is what is important, rather than a “collection time”. Sampling rates of 200cc/min or less are normally specified for permanent wells, although slower flow rates may be needed for shallow probes (5, 10, 15 feet) and sub-slab measurements if soil permeability is not sufficient to maintain flow rates of 200cc/min while maintaining less than a 100” H2O downhole vacuum (approx. 7.3” Hg) during the sampling process. In the case of low permeability soil, flow rates of 50cc/min or even less may be needed for shallow, temporary probes. 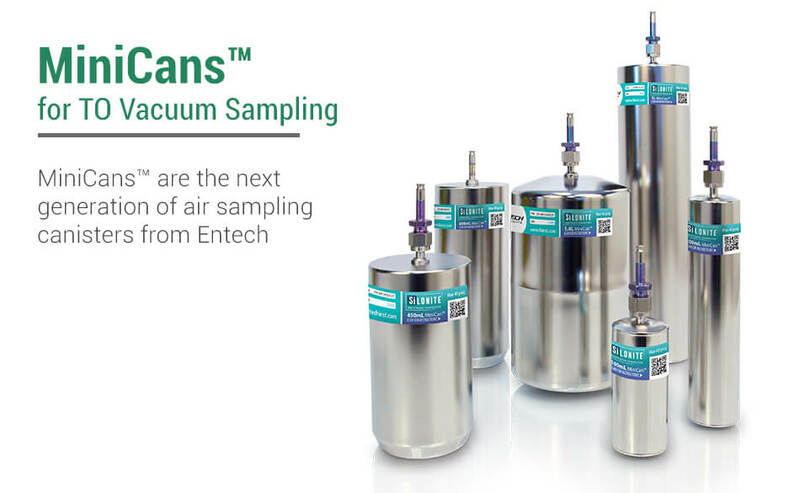 Sampling rates rather than sampling times take the canister volume out of the equation, and in fact, a smaller canister size allows shorter sampling times, which improves efficiency, and reduces the amount of tracer gas, such as helium, that is needed. When using a tracer gas, continuous attention is generally required during sample collection, so a quick sampling of 5-10 min rather than 30-60 min is highly desirable. When collecting within 5 feet of the top of the vadose zone, a 10x attenuation is considered a conservative estimate of what may be introduced into the indoor air environment. To achieve the necessary levels of detection, an analytical volume of 25-100cc is typical when performing a splitless injection. Therefore, in order to allow at least 2 analyses per sampling event, a minimum sample volume collected should be 400cc. Since canisters are often not filled to atmospheric pressure, adding another 50% to that volume would provide a safety factor to ensure there is plenty of sample for a rerun. That means a total canister volume of 600cc is optimum to allow repeat analysis if needed. Rotary valve based autosamplers that were common with ambient air canister analysis from 1990 through 2010 using 6L canisters requires a flush volume of 20-50cc to ensure that the gas in the “common line out” of the stream select valve is well equilibrated to the next sample concentration. This in itself requires a larger canister size when considering that it may be necessary to run a sample 2-3 times. The introduction of robotic autosamplers that do not require any preflush volume is a big reason why smaller canisters can now be used. Even HDS Personal Monitoring canisters that contain only 50cc are analyzed successfully with the Entech 7650-M robotic autosampler, so 600cc canister analysis is obviously not an issue. When the heated sample line makes a connection to the top of the canister, the volume measured by the pre-concentrator during trapping is actually the volume that passes the canister valve into the heated transfer line, not the volume that flows through the trap at that particular moment. After trapping the sample, the robotic autosampler moves the heated inlet to a Nitrogen or Helium flush port to flush the rest of the sample to the traps, ensuring a complete and quantitative delivery of the sample. There is simply no way to do this with a rotary valve autosampler. The 7650-M Entech robotic autosampler makes the analysis of 600cc canisters not only a reality but improves the accuracy relative to 6L canisters analyzed through rotary valve autosamplers by eliminating the line to line variability in the background created by the 16 separate lines used in rotary valve based systems. Is a 600cc canister size within State guidelines? A few labs have been promoting the even smaller, 400cc canister for soil gas and IAQ over the past 20 years, using SIM monitoring of 100cc out of 400cc canisters to achieve 10 part per trillion MDLs for most compounds. Many States specify volumes of 400 to 1000cc as acceptable canister sizes, so 600cc is definitely within this range. "Canisters can be screened without the complication and hassle of 100% desorption..."
Items 1-3 above are obvious. Some labs have considered trying to bring on US EPA Method TO17 for soil gas analysis simply due to the cost of shipping larger canisters. Instead, 600cc canisters are smaller than the combined volume and weight of tubes and sampling pumps needed to perform TO17. On top of that, trying to perform dilutions using TD tubes to address the million-fold concentration range found in soil gas can be a nightmare. Alternatively, a simple syringe transfer from one canister into another, or into a clean Bottle-Vac makes dilutions with canisters extremely easy and reliable. In addition, canisters can be screened without the complication and hassle of 100% desorption and retrapping on other tubes that may have unknown levels of contamination. You can’t take just part of the sample out of a tube, but you can out of a canister. The Entech 7650-M robotic autosampler can handle 48 samples unattended, all making a direct connection to a single heated line. That is far better analytically than attaching 16 canisters each to separate transfer lines with individual background levels based on their exposure to previous high or low-level canister samples. Using the 7650-M robotic autosampler, a full 48 600cc canisters be either screened prior to analysis, analyzed through the 7200 with zero potential for cross contamination, or blank tested with faster throughput than rotary valve based solutions. All of this means a more accurate solution and greater productivity for the laboratory, in a smaller amount of space. For Indoor Air Quality testing during vapor intrusion investigations, a 200cc sample size can provide low part per trillion level detection, and single digit part per trillion MDLs when using SIM analysis. With the ability to sample for 24 hours using a CS1200E6 flow controller into a 600cc canister, these smaller canisters could even be used in place of 6L canisters for low-level work. Alternatively, a 1L Silonite canister can be used with a CS1200E5 flow controller to collect a 24-hour sample as well, giving, even more, sample for more repeat analyses if needed. Reducing the volume from 6L to 1L certainly, provides a huge reduction in shipping costs and required lab space, while boosting productivity. A full 24 1L canisters can be analyzed unattended on a 7650-M which is generally enough to keep the system operating 24 hours a day at least from Monday through Saturday morning. For 600cc canisters and 48 sample automation, that runtime extends through to Sunday morning with no overtime scheduled. The future of TO15 lies in the improvement in the efficiency of how this method is performed. Taking advantage of today’s higher sensitivity GCMS systems and improved sample preparation technology means being able to use smaller sample sizes, from smaller canisters. As long as the technology is now available to take advantage of these smaller canisters (low flow samplers,no pre-flush autosamplers), labs can dramatically improve their efficiency and competitiveness by moving towards smaller canisters. Considering that more and more States are approving smaller canisters for soil gas monitoring, the transition should occur fairly rapidly.